In the centre of Lake Encarthan looms the dreaded Isle of Terror, accursed land of mystery and treachery. Hidden within the island's negative energy storms, the secret treasure city of the wizard-king Tar-Baphon has lain sealed for centuries. Now masked cultists have opened the golden city of Xin-Grafar to claim the wealth of the legendary city for the Living God Razmir. Can the PCs track the cultists through the poisoned swamps and blasted wastelands of the Isle of Terror to the City of Golden Death itself? And what forgotten dangers will oppose them as they struggle to prevent a dark faith from spreading across the world? 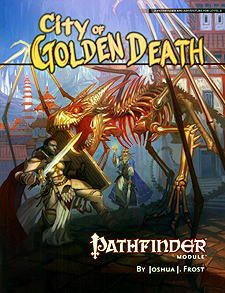 City of Golden Death is an adventure for 5th-level characters: it is written for the Pathfinder Roleplaying Game and is compatible with the 3.5 edition of the world's oldest RPG. The adventure features a mix of wilderness and dungeon sites and includes a race through a ruined, golden city to stop evil cultists before the city floods the molten gold!